I want to share my intial feel of one of the few kickstarter projects i have backed, the first one was DemonWars:Reformation by the Salvatore’s (Bob and his two sons). The second one is The Strange by Bruce and Monte published by Monte Cook Games. I backed The Strange mostly because of the hype of Numenera which i missed, so i didn’t wanna miss what could be the next big thing. 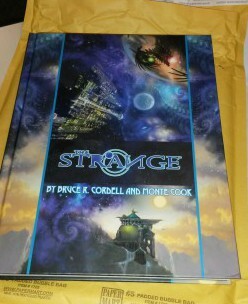 The Strange is a fitting name for this very hefty tome, it weighs in at 1.5kg/3.3lbs and 413 pages. It is wonderfully decorated outside and inside with awesome artwork that oozes (positively) the perfect atmosphere for The Strange. The book feels good in my hands, the smell, the sound, the look and experience of thumbing through this nice tome is great. It was a most awesome thing to unpack and behold for the first time and it is still a satisfying feeling picking it up. I did however stuggle abit with the concept of The Strange, i tried to read it from the start and getting to know how characters work from a mechanical viewpoint is great for learning how a system works. But, i am more driven by the fiction and narration than mechanics, so i had to skip around the book in a non-liniar approach. I wanted to know ‘What IS The Strange?’ much like ‘What is The Matrix’ and The Strange initially suffer abit the same affliction in the way that “Nobody can be TOLD what The Strange is, you have to see it for yourself”. Okay i’m overdoing it abit but it was too good to pass up, but getting my head around the fictional concept of what The Strange is, and what this setting is about, took me awhile and abit of going back and forth between various chapters. But it appears the creators might have foreseen something like this, in the margins on each page are several notes on where to find things mentioned in paragraphs on the page. Special characters, locations and so forth mentioned will be noted in the margin with a page number. The book is split into chapters as is custom and they deal with their own topics which in broad strokes are: characters, equipment, rules, setting, being a gm, creating stories for the strange, recursions, advesaries (monters, npc’s) and a premade adventure “The curious case of Tom Mallard”. The mechanics of the game is the Cypher system which seem very straight forward, light and simple which is something i have come to adore ever since i ran into WRM by Stargazer Games. A simple and light rules system allows for much more focus on story and action and it is alot easier winging it when there is no specific rule dictating how it’s supposed to be dealt with, thus avoiding the rulelawyer debates. Monte Cook Games are also releasing a book with this rule system as standalone, which is great and deffinently something i would want to look closer at if i’m satisfied with running some Strange scenarioes. At the core of it all are the Cyphers, an item that allows a character to do something amazing. Using standard fantasy tropes this could be a ring of invisibility, a staff of command or even a thieves kit. It does not have to relate to a magic item or an artifact as such, any item that could boost you and make you do something amazing. However all of the above is not essentially that which i fell in love with, that would instead be the scope of the setting in lack of better words. What i really enjoy about The Strange is an idea that i also had with my own Shadow Council story, the fact that it can embrace practically any kind of setting, and in The Strange it is done via Recursions. The foundation of The Strange itself allows a GM to send the players into any kind of setting they want. I can’t help but feel a vauge connection to the old Planescape concept which i absolutely adore. The freedom this kind of story brings to a Game Master is awesome and THAT is what sold it to me. As a Player i love the idea of translating and trying out new skills, which explains why i always have to have one of each class in any RPG computer game, i’m curious that way. So being able to change my character, but still retain my character is a great new twist i’m dying to try. As a Gamemaster i love that i have the freedom to send my Players into bascially anything i can imagine or pull out of books (Worlds numberless and strange was just released with a ton new recursions!). I don’t have to bother a whole lot with a compendium of rules and instead focus on story. As a Indie self-publisher the many many possibilities for adding ideas to The Strange ‘universe’ is exciting! The Strange feels like something that is here to stay, it will take some getting used to but unless you are diehardclosedoff ruleslawyer afraid of trying new things i’m sure this will win you over. It is a setting that can be expanded upon indeffinently with any kind of new ideas because the foundation is such a broad scope. The system is light, characters are not as bound as we are used to, story is in focus, what’s not to like? I am still in the process of digesting this tome, for now it is resting on the coffee table while the contents are bouncing around in my bonecage making its own connections to my personal imagination. I am happy with backing this project on kickstarter and i am looking forward to play it as either player og gamemaster. At the moment i only got one thing going against it, as i live in Denmark and are playing with Danes the english language can become a barrier for some players. The potential group for a game with me would have some issues and i am contemplating various home made solutions to this. As far as introducing new people to this, i imagine not explaining the background story but only mechanics and character building and work it like ‘Fringe’. Start out with one or two cases that is midly influenced by The Strange and Recursors, let them observe and experience Strange things and have an organisation representative step in and ease them into it through that npc. Previous post: I name thee thy True Name! Next post: GM Nostalgia #13 – Alsgard Tower, the seat of power to a Black Knight.